Embraer's Lineage 1000E dons moderne streamline styling reminiscent of New York's famous 20th Century Limited. 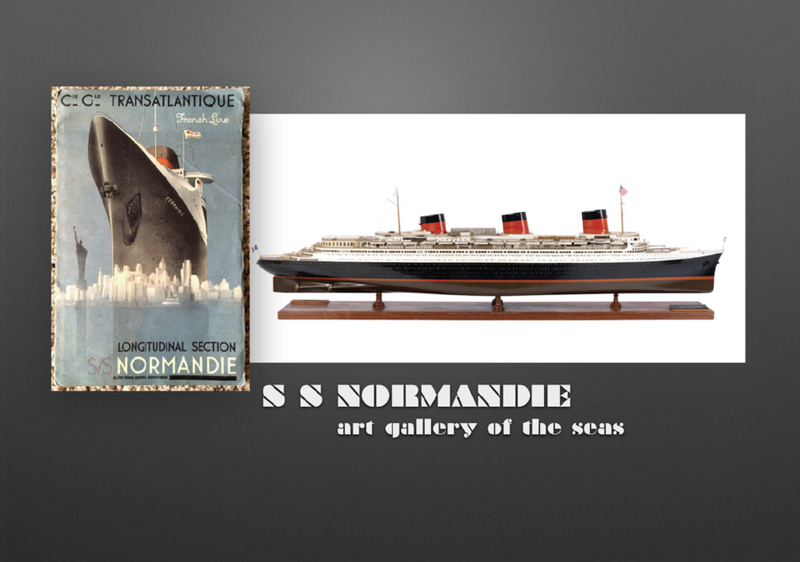 Embraer Executive Jet's VP of Interior Design, Jay Beever was inspired by the spacious luxury of Ocean Liners like the SS Normandie and the HMS Queen Mary and the elegance of the Art Deco period. We were thrilled when he asked us to bring our period expertise into the charter jet layout they were envisioning. 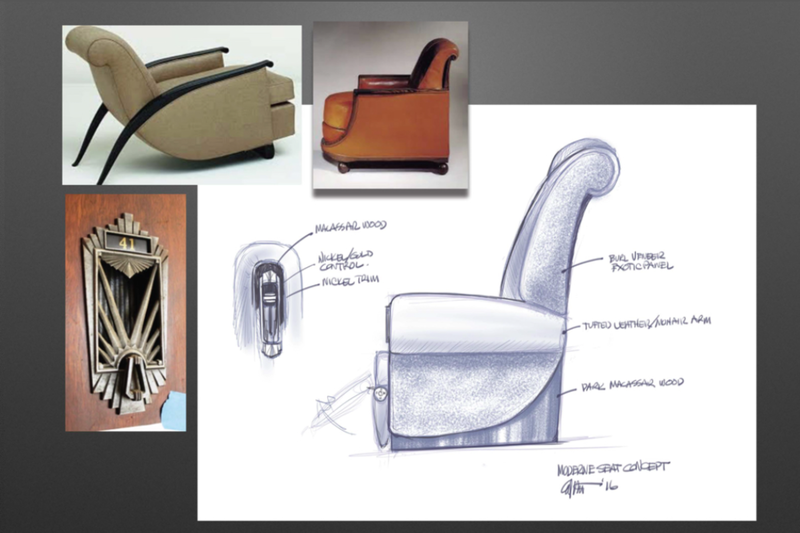 Here are designer Eddie Sotto's "thumbnail" hand sketches and research imagery that inspired the Manhattan. Shagreen panels surprisingly unfold to become barstools at the Cloud Club. Bookmatched macassar ebony piped with nickel and gold accents set off this handsome bar. 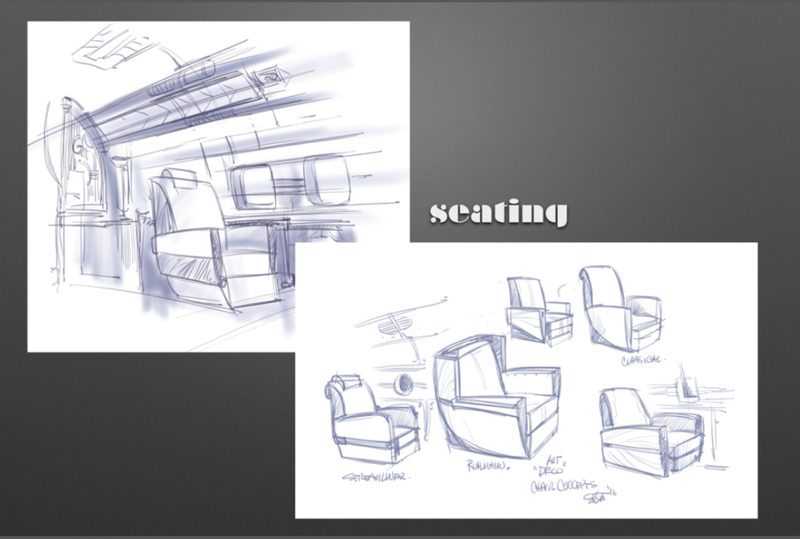 The Club areas are fully wood paneled, while the rest of the aircraft is in softer hues and leather walls. The magnificent and exclusive Cloud Club lobby with Mr. Chrysler's tools enshrined in a glass case. High atop the iconic 1929 Chrysler building, it epitomizes the Art Deco industrial style. A prefect inspiration for the Manhattan. Flanked by alabaster torchere's, Embraer's theater experience is like no other. In full surround and featuring a 4K display, you'll want to finish the movie long after you've landed. Manhattan is about the details as well. Shagreen barstools and Mohair seats reward your closest inspection. Embraer has more information and design options for you to explore on their site as well. SottoStudios is proud to support to this fine project. The Rainbow Room in the sky. Embraer's Lineage 1000e exclusively provides the largest window in aviation and surrounds it with intelligent lighting that enhances the view. With the help of 4 swivel club chairs facing our luxurious mohair sofa, the art of conversation can now be elevated to a higher plane, as did the salon's namesake, aviation pioneer Santos Dumont. Surrounded by the warm glow of alabaster torcheres, this cozy arrangement encourages a more intimate setting for those sensitive discussions. Dining in the sky has never been like this. The Manhattan's elegant Crystal Room elevates the dining experience to a new level with inland woods, navy mohair seating, inlaid tables, book-matched panelling and the appearance of glowing crystal. Read a recent review here. With the Lineage 1000e there are many ways for us to customize the interior to your unique look. A change of color and a lighter touch can feel more like a moonlit night over Miami than cocktails in the Rainbow Room. WE have inlaid the bar with onyx and mother of pearl atop hand woven silk caropeting, surrounded by french mohair love seats, all flanked by shagreen walls paneled in gray bleached exotic woods, delicately trimmed in brushed moderne nickel. Naturally, the Embraer "canvas" can be easily streamlined. Contact us to discuss your dream.